Reading Martha Wells is always such a delight, but All Systems Red seemed like such a departure from her usual projects so I had no idea what to expect. As it turned out though, this little novella was a real treat. Told from the point of a view of a rogue SecUnit—a part organic, part synthetic android designed to provide humans with protection and security services—this story takes readers on a journey to a distant planet being explored by team of scientists. Accompanying them is our protagonist, a self-proclaimed “Murderbot”, whose presence is required by the Company sponsoring the mission. Thing is though, Murderbot doesn’t exactly feel warm and fuzzy towards humans, and it knows that the scientists aren’t too comfortable with having a SecUnit on the team either, given the cagey way they get whenever it’s around. Still, that’s just fine for Murderbot. Having hacked its own governor so that it doesn’t have to follow Company directives, all it wants is to be left alone to enjoy the thousands of hours of entertainment vids that it has downloaded from the humans’ satellites. Of course, no one can suspect that Murderbot is secretly autonomous, so it still has to go about its job like everything is normal, and this arrangement was working out just fine until one day, a routine surface test goes seriously wrong. Murderbot ends up saving the day, earning the admiration and curiosity of the team leader, Dr. Mensah. Soon, Murderbot is left with no choice but to take the lead in defending the scientists, when disaster strikes another neighboring expedition on the planet and threatens to come after them next. Having read a few of the author’s Raksura novels, I was already familiar with her penchant for throwing readers into the thick of things, leaving them to gradually feel everything out for themselves. Thus I was unsurprised with the way this story opened—by unceremoniously dropping us into Murderbot’s head with hardly any context and minimal background information given. It takes a while to even grasp the kind of protagonist Murderbot is: an artificial entity, albeit a very sentient and self-aware one, complete with personality quirks and a dry sense of humor. While I’ve read plenty of books starring robot protagonists, I can honestly say I’ve never met one quite as unique and interesting as Murderbot. Martha Wells may be tight-fisted when it comes to the details, but she knows exactly how to get your attention. Everything from Murderbot’s anti-social tendencies to its love of cheesy soap operas made me want to keep reading to discover more about the character and why it is telling this story. At just a little under 150 pages though, and with so much ground to cover, there’s not much opportunity to stop and take a breath. As much as I loved how this book was so snappy and fast-paced, you do have to find your footing quickly or risk getting left behind. This means learning and familiarizing yourself with the characters as soon as they’re introduced, and most of them, like the humans on the science team, are only going to be lightly sketched. This was probably my only criticism; considering how over time, Murderbot comes to see the team as “its humans” and become very protective of them, it would have been helpful to develop those characters a bit more, especially since our protagonist begins this tale by being very disdainful of them. Still, there wasn’t much else I didn’t enjoy about this book. It was entertaining, and more importantly, it also felt complete to me, unlike a lot of novellas that leave me wanting more. Plus, this snarky first-person narrative style is quite different from what I’m used to when it comes to Wells, but I think I could grow to like it! Murderbot’s narration was a joy to follow, and I even found myself chuckling at many of the story’s scenes. Overall, I found myself pleasantly surprised, and I definitely would not hesitate recommending All Systems Red to anyone looking for a quick sci-fi fix with a fun and captivating premise. I was excited when I found out this was going to be a series, and I can’t wait to check out the next installment of the Murderbot Diaries. Cool, I’d be curious to hear what you make of it! Murderbot’s hilarious. I’m glad I was able to put it on your radar! I loved this one, and having only read two other MArtha Wells books before, it did seem like a fun departure. I got a kick out of Murderbot’s personality too, and his struggles with whether to help the humans or not. Good stuff. Yeah, it felt so different from her Raksura books. I’ve also read her Star Wars book, but I guess I didn’t really count that 😀 She had to write within the boundaries of the universe and everything. 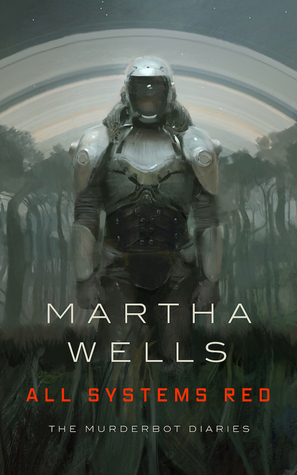 I’m always curious when an author switches from one genre to another, and having enjoyed the first Raksura book I’m beyond interested in seeing how Martha Wells works inside science fiction parameters. And your description of Murderbot makes me want to get to know him as soon as I can 🙂 Thanks for sharing! I haven’t read anything by this author but I have this on my list. It seems right up my alley! Yay, I hope you get a chance to give this one a try! Me too! Can’t wait to get back into it with Murderbot! This sounds great! I do love robot/android stories, especially when they turn out to have a lot of personality. This sounds like something I’d like tbh. I’ll have to add it to my list – it’s an easy length too which is a bonus. I’ve heard very good things about this one 🙂 it’s too bad it’s so short! But I think there is a great chance that I’ll be reading this one sometime. Loved this novella so much! Murderbot Murderbot Murderbot!!! I’ve only read Martha Well’s Stargate Atlantis books (which are excellent) so I’m really looking forward to trying something else by her. Yay for sci-fi! I’ve only read a couple of her Raksura books, as well as her Star Wars book. I didn’t know she wrote some Stargate tie-ins too, how cool!